The Core Stories | A story about getting to the roots. A story about getting to the roots. I spent the second weekend of July at a yoga retreat. In addition to practicing vinyasas and meditations, we learned some chanting, which is a fancy term for singing Sanskrit phrases whose spellings are unfathomable and meanings incomprehensible. There’s one particular tune that got stuck fluttering between my skull and rib cage, so I Googled the words. Lokah Samastah Sukhino Bhavantu: May all beings everywhere be happy and free. After the retreat, I took a train up to Vermont, where I spent two weeks volunteering at an art and wellness center with a vast organic garden. I wrenched weeds from the soil and greeted glimmering earth worms and bumblebees and gem-winged beetles. I picked blueberries and currants, harvested garlic and oregano, and hauled woodchips up the hill to expand the paths between the different patches where green vines outstretched like giddy limbs. At the end of each day, I was splotched with dirt, soggy, frizzy-haired, sun-spent — and smiling. Every evening shower was the best shower of my life, even though I was never able to remove the brown grit from underneath my nails. My forearms remain etched with thorn scratches, and there’s a blue bruise on my bicep where I got punctured by a wild rose. My knees got stung by nettles twice over. Still, while I worked, scattering droplets of sweat like glitter, I couldn’t seem to stop humming that Sanskrit blessing under my breath instinctively. Lokah Samastah Sukhino Bhavantu. The owner of the place, who I’ll call L, told me that the earth is an ally to any human healing process. She taught me to recognize all of the plants with medicinal qualities. I plucked tiny yellow flowers of St. John’s Wort and submerged them in olive oil in a mason jar, which is now sitting in her window sill. In three weeks, the mixture will make a potent massage oil. I’ve never liked anise flavor, but I ate fresh anise leaves straight from the stem and puckered with delight at the surprising sour sweetness from the unassuming green frond. I love anise now. L walked me around the garden like it was a treasure hunt, plucking a leaf here, a flower there, popping the things onto her tongue to confirm their identification. Ah, yes, wild carrot. She ruffled fingers through the stalks and shoots like she was lovingly tussling a child’s hair, reminding me to thank the earth for its gifts. The gifts were many. The grounds were overflowing with mint for tea, with blackberries for breakfast smoothies, with oregano and thyme to top salads of kale and lettuce from the patch down by the pond. Lokah — lavender stems — Samastah — strawberry sprouts — Sukhino — spinach bunches — Bhavantu — blueberry bushes, dripping with dew and soft purple pearls. L’s cat named Bae was adopted not by intentional choice, but because Bae showed up one day months ago and refused to leave. As friendly as any lap dog, she mewed to request belly rubs, and at night, she curled up with her head rested on my own belly as I sat at the picnic table, writing or reading (or scanning my Twitter feed for updates on the mass cultural turmoil ensuing outside of that oasis) until the sun melted away. I ran my thumb between her ears with Lokah Samastah Sukhino Bhavantu on my breath. During the day, she roamed around the property, probably preying on moths and other bugs in the brush. But I typically spotted her lounged long and luxurious in the shade of the mulberry tree, or sometimes snoozing on a chair inside, curled around herself like a fiddlehead fern. She opened one eye to wink at me slowly and stood and stretched to slink figure-eights around my ankles. With free reign to wander, it seemed miraculous that she chose to stay; that she didn’t flee to fall in love with an alley cat in town or retreat to the woods for new terrain to explore and new critters to capture. But she was fiercely loyal, that one. She was a furry, four-footed lesson in love and trust. One afternoon, I was struggling to tug sunchokes from the soil as he was filling buckets of water with the hose behind me. “Where did you come from?” he asked. He meant this question as a casual conversation starter, not as an accusation, but I laughed, reminded of how much I was an alien there, really. Picture the newsflash: New York millennial lands in rural oasis and attempts arduous yardwork in shiny gold Birkenstocks. The martian seems bizarrely fascinated by kale plants and butterflies as if she has never witnessed wildlife on her native planet reigned by Uber and $5 lattes. “Brooklyn…New York?” he asked, as if there are other Brooklyns around. He eventually ambled off with his buckets of water while I sifted through my stacks of sunchoke stalks. They’re supposed to have large edible roots, but these ones were tiny tubers. I collected them anyway, stuffing the little white thumbs into my sports bra to carry back to the house while dragging the stalks — taller than my head — over to the chicken coop. Lokah Samastah Sukhino Bhavantu, I told the hens, and they clucked back, diving their beaks into the scraps. Every day seemed to expand when spent almost entirely outside. Not a minute slid past unnoticed, the way minutes can so easily be sucked into the slippery abyss of the laptop screen, drowned in Chrome browser windows or buried between Gmail messages. To avoid forgetting each salient but poignantly temporal moment, I kept careful notes in a journal. 7/17: Hummingbird spotting in the bee balm blossoms!!! It turned to look at me, then jetted off with a wink of wild wings. 7/18: Glint of garden snake slinking between thorny branches of blackberry bushes. 7/19: Walked to 7-Eleven for coffee. Man with chalky combover and one lone, lopsided bottom tooth came up behind me in line, tapped my shoulder, told goofy (grand)dad joke in voice like warm seltzer. Laughed as earnestly and generously as I could. Meanwhile, I tried to learn to tell time by the placement of the sun, with my fingers typically too dirty to reach for my iPhone clock. But there was a church nearby that tolled every hour, on the hour, as a friendly FYI. Its letterboard was flanked by a rainbow flag on one side and a Black Lives Matter sign on the other — the wisdom of Lokah Samstah Sukhino Bhavantu, proudly staked in the grass. A plant’s energy shifts down to its roots when its flowers wilt and its leaves go brown. That’s why the best, biggest bulbs of garlic are harvested when the green shoots get gold and withered. I can’t help but see this as a metaphor: we can’t focus on our inner selves, on grounding, while fully active in the public world. Developing deep strength isn’t glamorous to the outside eye — it’s not a jubilant shout, but a muffled murmur coming from the core. After the roots are robust, the energy pulses back up again. Buds blossom. Personal healing may seem counter-intuitive or even selfish when the need for activism is so dire. But it’s a crucial component of the larger societal growth cycle. You have to practice tending to your own peace of mind — those tiny sprouts of self-becoming like delicate pea shoots — without settling into passive silence. You have to seek ways to participate in nurturing this wild world’s wellbeing without losing your own roots: your formidable network of values and your sturdy understanding of your fundamental virtues and flaws. At least, that’s what I told myself. The chant is too simple, of course, in the same way that “all lives matter” is too simple. Of course all lives matter; of course all beings everywhere deserve to be happy and free. But certain lives demand to be acknowledged and honored specifically, because they’ve been dismissed far too often for far too long. For example: black lives, like those of Philando Castile and Alton Sterling. Black lives matter. Queer people count, like the 49 from Pulse whose names warrant ritual repeating. The policemen attacked in recent weeks were robbed of their due livelihoods, too. They were pinpointed as symbols, punished for their group identity, instead of honored as unique individuals. We are all unique individuals. But we are bound together in our uniqueness — the way the spiderwebs stretch between the blackberry brambles, connecting branch to branch. The way the wild vines twist between the squash blossoms, weaving from one side of the bed to the other. The way the clovers (my favorite weeds to pull) grow their roots grow horizontally underground, spanning more feet than you can imagine. All it takes is a gentle tug of one tiny stem to reveal a widely meandering network, invisible until unearthed. We are unique, but bound, both. Perhaps that’s why Lokah Samastah Sukhino Bhavaintu lingered with me, as if its slightly strange and foreign softness was a way to approach the contradictory truth. With Sanskrit on my mind and soil on my hands (and in my elbows, and behind my ears, and between my toes, and across my forehead), I witnessed infinite versions of existence: the bitty bug wings, dazzling beetles, furry paws, giddy green leaves and rich red roots, each distinct, each linked, each worthy of a tender touch. Some people are building their own houses and harvesting their own food while some people cite Ikea and Seamless as necessary survival tools. Life is no more and no less than a thing that breathes, that stretches, that sings in its own way — in its own way — while sprouting, almost unbelievably, from one earth. I believe that’s what we call diversity. How magical. How commonplace. 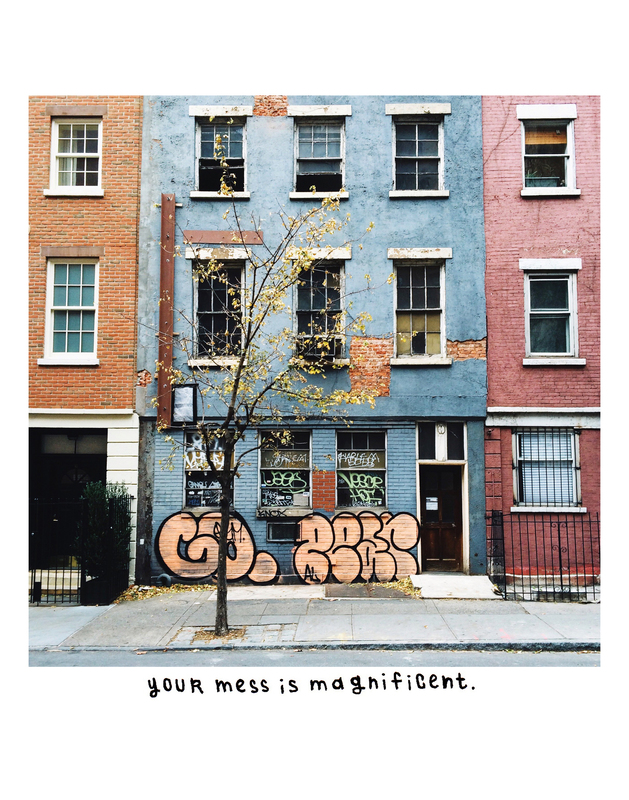 How messy and magnificent. As nature intended.